When Mike Kloepfer got his first “insider’s” look at an earthmoving scraper, he saw a machine in need of some critical examination. “Scrapers have been around since the 1800s, but they haven’t seen much innovation in decades, really. When we got out and talked to customers, they all told us about problems that they’ve had for as long as they can remember,” says Kloepfer. For Bult’s project, constructing a new airport site, conventional open bowl scrapers were simply too costly. After purchasing a fleet of tractors and pull-pans, he found the scrapers could not load and move material as efficiently as hoped. Then his tractors, overstressed by the large loads on their drawbars and rear axles, began to fail prematurely. Bult’s past experience told him that the issues seemed to center on how the scraper loads were getting transferred to the tractor. He started to experiment with his own ideas of how to alter the coupling between the bowl and the power unit. Then, after a few trials, he brought his ideas to Titan Trailers. As a specialist in custom-built highway trailers for heavy-duty hauling, Kloepfer’s appraisal of that first unit was immediate. “Jim’s concept is correct and we can put our engineering team to work on it,” he said. Recently, Kloepfer made good on his promise to “develop Jim Bult’s concept.” Titan’s new Earthmoving Equipment Division has launched its S4412B scraper system, a 44-yard capacity heavy-duty scraper bowl integrated with a Bell 4206D scraper tractor. Tapping into his experience with trailer customers, Kloepfer invited Jim Bult and several other earthmoving contractors to work with the Titan design team in the machine’s development early on. As a result, the S4412B has a look and feel unlike any previous scraper on the market. Indeed, those highly visible aspects of the S4412B represent two of the most significant design decisions made by the Titan team to fully utilize the capabilities of its third key component: the Bell scraper tractor. Kloepfer feels that this scraper’s most important innovation is its High Arch Drawframe, based on the coupler that Jim Bult produced for his experimental scrapers. The distinctive gooseneck-shaped drawframe couples the scraper and tractor through a massive 12 in. (30,5 cm) diameter ball hitch. The High Arch coupling system is the backbone of the scraper and helps Titan achieve several of its design goals. The articulating and oscillating range of motion of the hitch also improves maneuverability and stability as the scraper moves over uneven terrain which minimizes the transfer of energy from the scraper to the cab – operators get a smoother, more comfortable, safer ride. The compact connection also allows the 55 ft. (1 676,4 cm) long scraper system to turn within a radius of just 39 ft. (1 189 cm), helping operators to work quickly and safely on congested jobsites. 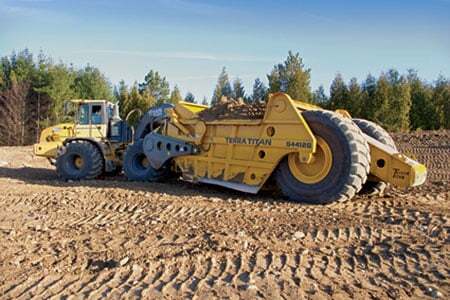 To further support their design and development team, Titan hired a scraper owner/operator who has more than 40 years of experience in the earthmoving business. His first-hand knowledge as to the performance of all types of open-bowl scrapers and customer expectations has proven invaluable in the development of this product. The hydraulic system of the S4412B provides extreme duty hydraulic cylinders with self-aligning spherical steel bearings at all cylinder anchor points, along with stainless steel lines and 4-wire braid hoses throughout. Features such as heavy duty trunion balls and caps were also a response to customer requests for a simpler more reliable scraper.